If you have ever seen the movie "King Kong," you may remember the building that the giant ape climbs. 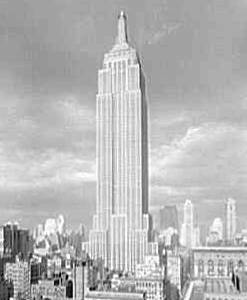 The Empire State Building officially opened on this day in history, May 1, 1931. President Herbert Hoover pressed a button in Washington, D.C., and on came the lights in the world's tallest skyscraper. Before that, the Chrysler Building briefly held the record at 1046 feet. Now, the tallest building in the United States is the 110-story Sears Tower in Chicago.